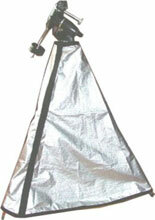 Every TeleGizmos Cover is manufactured intheir ownshop. Only the finest commercial Juki sewing machines are used.TeleGizmo seamstresses are skilled experts in crafting the covers, both standard sizes and custom work.They take extreme pride in consistently producing only the highest quality scope cover products.TeleGizmos alsowarranties alltheir covers with a solid, no nonsense commitment to fully provide their stated level of performance. With TeleGizmos,their reputation has been earned by providing top quality products with uncompromised customer service. 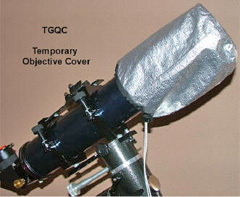 You can count on your TeleGizmos Cover to provide you with the performance you expect, first time, every time.They know solar radiant technology,they know design, andthey know telescopes. 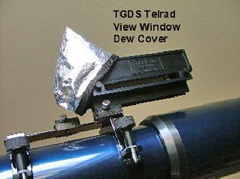 TeleGizmosoffers a diverse selection of original styles, designed and developed for every type of scope and mount set-up. But just incasethey don't already make what you need,their extensive experience in manufacturing custom orders for customers enablesthem to produce covers in shapes and sizes that exactly matchyour requirements. 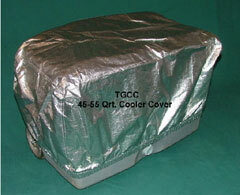 And custom cover pricing is not expensive...often no more than a comparable standard size cover. Turn around times for custom orders are fast...4-5 business days on average. 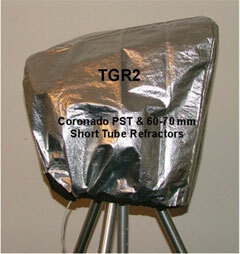 TeleGizmoscovers go through extensive testing bythem and with in-the-field customer testers. Theyare continually evaluating their covers through designed testing programs; checking on all aspects of performance.The 365 Series Covers were developed over six months and were tested in actual use for a year at several different and diverse locations before being introduced. Why? That's easy: If you're going to claim a cover can provide 24/7, 365 outside protection, you better be sure the trust the customer places in that cover will be not betrayed. 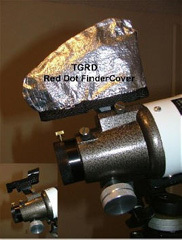 TeleGizmos' solar radiant barrier material is a proprietary structure unlike any other scope cover material available. 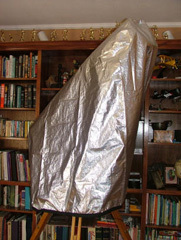 It is not Mylar. The internal aluminized radiant barrier is pure aluminum applied through a dispersion process that is accurately controlled for consistency. The fibrous webbing imbedded in our solar material creates a strong tear and stretch resistance foundation. All this is built into multiple layers of polyethylene. 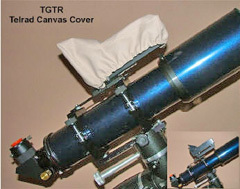 The365 Series outer canvas is the finest, ultra high weave count, acrylic coated material available in a telescope cover. 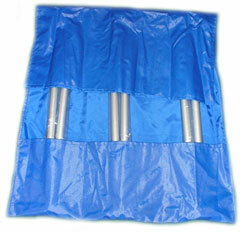 It has been rigorously tested to meet The American Society for Testing and Materials (ASTM) standards. Does meeting this high level of verifiable testing standards really matter? Yes, we believe it does. 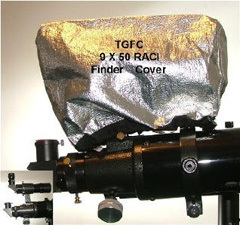 Customers should expect nothing less for their astronomical equipment protection. Like you,TeleGizmosis dedicated to the love of astronomy. 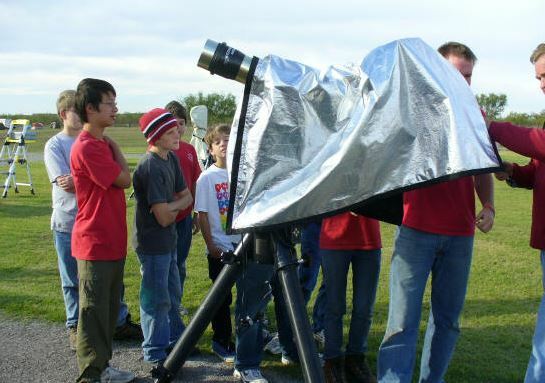 Like you,they have invested a great deal oftheir hard earned money intotheir telescope equipment. And like you,they want to protect that investment. Whether you own a classic 60mm Unitron refractor or a $30,000 TMB apochromatic, TeleGizmos will provide you with an uncompromised level of protection backed up by an uncompromised level of customer service. Top quality every time, reliability from a dedicated company, the most styles and sizes including custom sizes, time tested and proven performance...these are just a few of the TeleGizmos Advantages. TeleGizmos..."We've got you covered."